ZENERGY GEMS™!". If you are shy, wear carnelian. It is chakra warming and energizing of the 2nd chakra especially. Carnelian has been used to increase passion, sexuality, and physical energy with great success. Material: Natural Citrine. Quantity: 1 piece Natural Quartz Necklace. Notes:Due to the light and screen setting difference. the item's color may be slightly different from the pictures. Length: about 55.5cm. 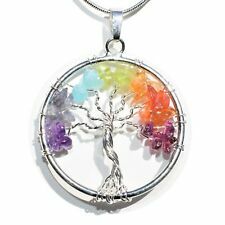 CHARGED 7 Chakra Premium Crystal Chip 18" Necklace Healing Energy REIKI WOW!!! Beautiful pure white heart pendant ishandmade from naturalSelenite Crystal carved and polished into a simple heart pendant. Selenite crystals can help facilitate communication with all aspects of the celestial realm. Selenite is natural negative energy absorber & best worn close to the throat or diaphragm to benefit from it's properties (read more below). It is a very soft stone which can be scratched easily with a fingernail. New for 2018 & Exclusive to Zenergy Gems! Finally!!! Each color crystal represents one of the Chakras of the body. It is a beautiful and spiritual necklace depicting peace and healing. The pendant and chain arrive new in a gift bag and you will get a copy of the pictured chart to use with the necklace. Selenite crystals protect,shielding a person or space from outside influences, blocking negative energy.Selenite crystals evoke protection from the angelic realm to dispel negative energy. Use Selenite crystal toattune to your vibratory rate and raise consciousness to a higher level. Use Selenite to open & connect to celestial realms. Use Selenite crystal toattune to your vibratory rate and raise consciousness to a higher level. 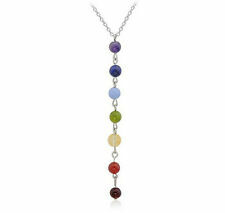 The 7 chakra gemstones are attached with silver onto the front of the pendant. Quantity: 2pcs Pendant 2pcs Chain. Weight: (approx.). 12 grams(2pcs Pendant 2pcs Chain). Material: Alloy & Glass. Size: (approx.). 45 6mm, 5mm for glass beads. In the Item location you can find which warehouse. I will do my best to solve the problem. Material: Gemstone & Alloy. Chain Length: 6 "-6.5". You will receive a similar item as the pictures show. Quantity: 1 piece. 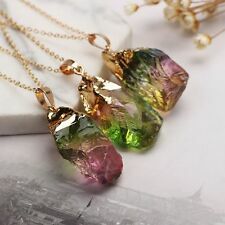 This is a very attractive healing crystal necklace. It is on a gold tone 24" chain which is very similar to a snake chain. It has a couple of black inclusions in the stone, which are natural markings of the stone. We will reply you ASAP. Sales Policy. We will do our best to solve your problem! We choose the high quality material for our products. Much obliged! Material: (Pendant)Gemstone & Copper; (Chain)Alloy. Rock Crystal Quartz: Length 45-70mm; Width 12-20mm. Quantity: 1Pc(Pendant Chain) 1Pc Pink Gif t Box. The Whole Pendant: Length 60-80mm; Width 12-20mm; Hole 8 4mm; Weight 35g. We will try to help u out. Quantity: 1 piece Pendant (No Chain). Size: (approx.). 45 6mm, 5mm for glass beads. Material: Alloy & Glass. In the Item location you can find which warehouse. Weight: (approx.). Material: Natural Citrine. Quantity: 1 piece Natural Quartz Necklace. Notes:Due to the light and screen setting difference. Size: Show As the picture. the item's color may be slightly different from the pictures. 2 PC x Pendant (without chain). Material: 7 Glass Beads Alloy Plated. Size: 38 33 mm. And will work hard to earn your praise. Necklace Pendant Size :(approx) 50 mmX30mm. Necklace Length: (Approx.). 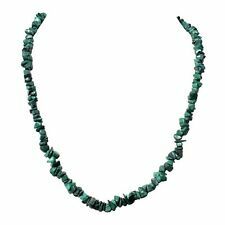 Quantity: 1pc Necklace. Note: There may be color tone depending on the resolution of your monitor slightly different.